As this is my first attempt of making a chiffon cake, I adapted the recipe of Green Tea Chiffon Cake by Just One CookBook. I am a big fan of the author, as she explains everything slowly and clearly, and I LOVE authentic home-style Japanese food. Feel free to pair the cake with fresh cream or fruits; but I wouldn’t mind having it on its own. Make this delicious treat for yourself and let me know how it goes!! In a large mixing bowl, whisk egg yolks and caster sugar (30g) until light and pale. Add canola oil, milk and vanilla, and whisk until well combined. Sift in cake flour, hojicha powder, and baking powder to the egg yolk mixture. Mix until totally incorporated. In another bowl (make sure it’s oil free), add egg whites and salt. Using an electric mixer, beat the egg whites at high speed until foamy. Gradually add the caster sugar (60g) using a tablespoon, and beat until all sugar dissolves and soft peak forms. This will take about 5 mins. Gently fold the meringue into the cake mixture in 3 additions. Pour the mixture into the ungreased 17cm chiffon cake pan (please do NOT grease your pan or otherwise your chiffon cake won’t stick to the pan and therefore collapse while baking). Tap the pan a few times to release air bubbles. The cake must be cooled upside down; balance the chiffon pan on a tall heavy bottle using the pan indent. Leave until the cake is completely cool before removing it. To remove cleanly, keeping the pan upside down and use a thin sharp knife or thin offset spatula, running it gently around the cake. Place the serving plate on top of the cake (which will now become the base of the cake) and flip over. The cake should pop out easily. Add the chopped chocolate in a mixing bowl. Set aside. In a saucepan, add cream, butter, and salt. Bring it just to boil over medium-high heat. Turn off the heat. Pour the cream mixture over chocolate. Let stand for 10 mins and don’t stir to prevent it from going grainy. Stir the mixture with a whisk until smooth and shiny. Add whiskey and mix well. 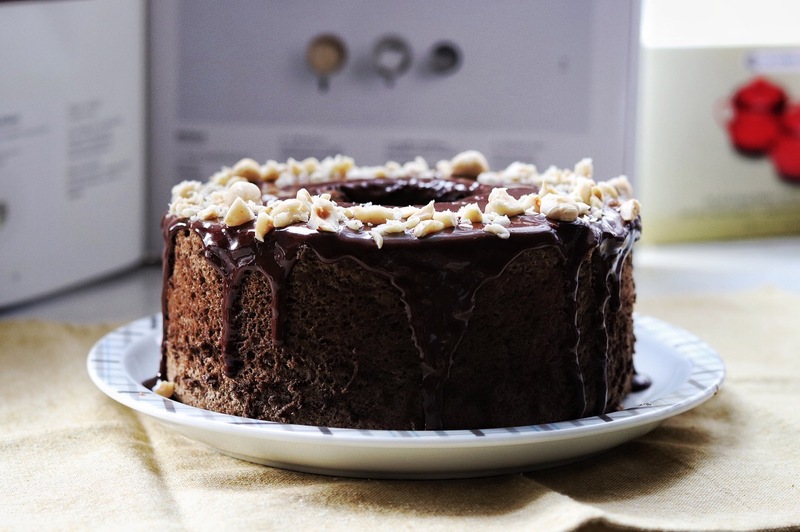 Pour over the chiffon cake and top it with chopped hazelnuts. Loving your posts! Your photography is really nice (and super drool-worthy).